This fabulous Earth party dress was named a winner in the CraftStylish Crafty By Nature contest! 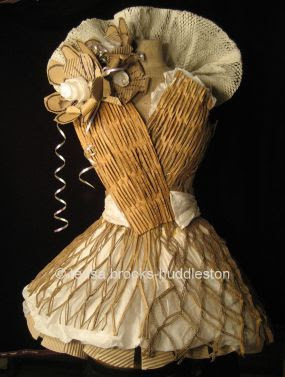 The entries had to be eco-friendly - any combination of recycled materials and/or items from nature. Terisa Brooks-Huddleston's sculptural design certainly fills the bill. It's made from recycled tissue, cardboard, and packing supplies. 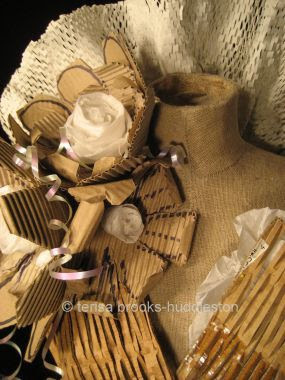 To see lots more of Terisa's inspired textile art, visit her blog, Running with Scissors [edit: no longer available]. There's much to see and her hilarious sense of humor just might make your day. I swear, someday I will take a day off, get a lot of cardboard, a cute model, and do something very similar! How come cardboard like this looks even better than real fabric? Fantastic!